We have not been able to trace his parents’ marriage. It may have taken place outside Moreton. John’s is the only baptism we have found for a child of John Hamlyn in Moretonhampstead around this time. There are a large number of Hamlyns in the nearby village of Bridford and in Widecombe in the Moor. There were 25 Hamlyns in Widecombe at the 1641 Protestaion Return, compared to 5 in Moreton. There is a burial for John Hamlyn senior in Moretonhampstead in 1626. This may be John’s father. If so, John would be only 12. John’s son William became a yeoman farmer. It is likely that John was too. William farmed at Willowray, on the road leading south towards Bovey Tracey. He was not the eldest son, so this may not have been where his parents lived. Willowray is close to Wray Barton, where the Southmeads lived. John’s mother-in-law Isaach Southmead grew up at Wray. There are two possible marriages for John. John would have been only 18. There appear to be four children from this marriage. On 30 Mar 1637 we have the burial of Agnise daughter of John Hamlyn, whose baptism we have not found. We have not found a burial for the first Jane. Just before the Civil War, the Protestation Return of 1642 shows five men of eighteen years or over named Hamlinge, Hamlin or Hamlyn in Moretonhampstead. They were John, Nicholas, Richard, Robert and William. In the Civil War that followed, the parishes around Moretonhampstead supported King Charles I, but Moretonhampstead itself was staunchly Parliamentarian. 46 men refused to serve in a Royalist posse. This was more than a tenth of the adult male population. This resistance came at a price. In 1645, the Royalist Lord Goring’s army rampaged through Devon after being heavily defeated in Somerset. They vented their frustration against Parliamentarian communities. In October, the Moreton register records the burial of Grace Vicarie ‘slayne by a souldier’. 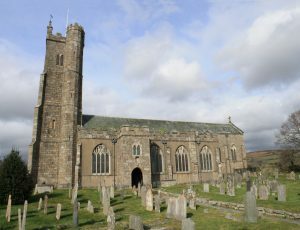 In 1646 the Parliamentarian army of Lord Fairfax and Cromwell camped in the graveyard of St Andrew’s Church before winning a decisive victory at Bovey Heath. There is a gap of seven years between the baptism of Jane in 1641 and the next baptism for a child of John Hamlyn in 1648. This suggests that this is not the same couple. There are pages in the burial register where there is a full list of entries on the left and right hand pages giving the usual details, such as “wife of”. A third column has been squeezed in between these, with the date against the spine on the left hand page and the name against the spine on the right hand page. This does not allow room for details about relationships. On 18 Sep 1643 there is a burial for Johane Hamling. At this time, Joan, Johan, Johane and Jane were used interchangeably. This could be a burial for John’s wife Jane. 1647 Apr 22 John Hamlyn and Jane Wreyford. This might be a younger man, who was under eighteen at the Protestation Return, or a second marriage for the widower John. The dates would be consistent with the latter. There are three possible marriages for John Wreyford: 1610 to Margaret French, 1614 to Richord Cassly and 1619 to Issott Southmead. Melanie Lucas’s identification of Jane’s parents as the third of these couples is supported by DNA testing. The Southmeads were one of the leading families of Moretonhampstead. Her uncle John was styled as a ‘gentleman’. Jane was the eldest child of this marriage. There appear to be two John Wreyfords having children baptised at this time, so we cannot be sure how many siblings she had. In the years leading up to the Civil War, Jane’s uncle, John Southmead, was the leading figure in the Puritan movement in Moretonhampstead. The Puritans strongly supported the cause of Parliament against Charles I. It is likely that the rest of the Southmead family shared these sympathies. Jane was 27 when, she married John Hamlyn. It is likely that he was 33 and a widower. The following year the will of John Southmead, Jane’s uncle, left 10s to each of his sister Isssat Wreyford’s children. Jane was the eldest of these. The marriage of John Hamlyn and Jane Wreyford is followed by the baptism of six children. Four of them were born in the time of the Commonwealth following the arrest of Charles I and his execution in 1649. The twins were born in the early years of the Restoration. We have found no infant burials for them. In the1674 Hearth Tax for Moretonhampstead, John Hamlyn pays 2s tax for one hearth. This seems rather low for a yeoman farmer. At face value, it suggests either John was of a lower social status, or he was dead by then and this is the tax for his 26-year-old son. We have not found an earlier burial, but there are occasional gaps in the register. There are, however, a number of illegible entries in the Hearth Tax return. There may have been another John Hamlyn paying a more substantial tax. 1699/1700 Mar 29 Joane Hamlin wid. Either of these is possible. If it is the first, she would have been 55, if the second, 80. The earlier is more likely. That would place John’s death after hers. There is a death in June 1676 for John Hamlyn senior. If this is Jane’s husband, he would have been 62. There are other burials on 30 Aug 1687 for John Hamlin, on 28 Dec 1692 for John Hamlin senr., and on 6 Aug 1693 for John Hamlin. The first of these would make him 73 at his death, the others 78 and 79. Most BMDs from parish registers on Findmypast.